Summary: We used tagged MR imaging to investigate the flow in two lateral and two terminal saccular intracranial aneurysm models of different neck sizes. Imaging was performed with a 1.5-T superconducting MR system using 2D fast spatial modulation of magnetization (SPAMM) sequences with an intersegmental delay of 25 milliseconds. The flow in the saccular aneurysm models varied with the shape and size of the neck: flow was faster in wider-necked aneurysms than in those with narrower necks. MR angiography is widely used in the evaluation of intracranial abnormalities, including intracranial aneurysms (1, 2). However, MR angiography sometimes fails to depict intracranial aneurysms. The main reason for decreased signal in aneurysms is thought to be slow or disturbed flow (3, 4). Previous work by Isoda et al (4) has documented the signal intensity in models of lateral and terminal saccular aneurysms with different neck sizes using 3D time-of-flight (TOF) MR angiography with various imaging parameters. In that study, noncontrast 3D TOF MR angiography showed terminal saccular aneurysms, or aneurysms with wider necks, or both better than it did lateral saccular aneurysms, aneurysms with narrower necks or both. Flow dynamics have also been presumed to have a significant effect on the signal intensity of aneurysms. The purpose of this study was to use tagged MR imaging to depict the flow in lateral and terminal saccular intracranial aneurysm models of different neck sizes. Imaging was performed using a 1.5-T superconducting MR system with a commercially available head coil. Teflon tubes with inside diameters of 10 mm were used as models for two lateral and two terminal saccular aneurysms with pulsatile flow. 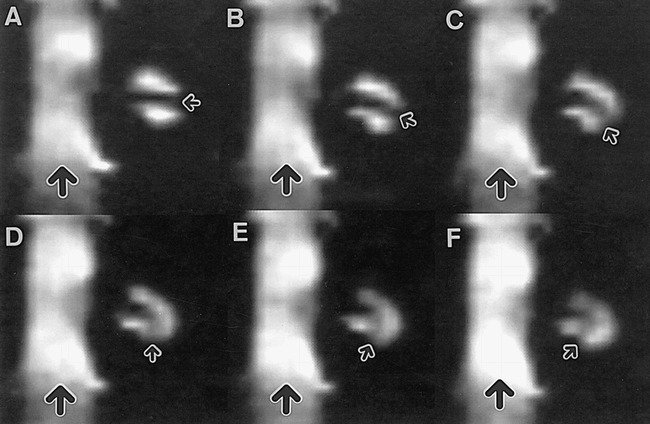 Their height and fundus diameters were 10 mm and their neck diameters were 2.5 mm and 10 mm, respectively (Fig 1). Pulsatile flow was created with a bellows pump and a constant flow pump with a pulsation period of 1500 milliseconds. Tap water was used as fluid in a closed-circuit system. After adjusting the flow volume of each pump, we measured the flow velocity and waveform with 2D phase mapping MR imaging defined by the following parameters: 40/7.9/2 (TR/TE/excitations); flip angle, 20°; field of view, 20 cm; section thickness, 5 mm; matrix, 256 × 128; number of phases, 16; imaging time, 6 minutes 26 seconds. The sequence was gated from the phantom trigger. Peak systolic velocity was 120 cm/s, and end-diastolic velocity was 40 cm/s (Fig 2). A–D, Spin-echo T1-weighted images (300/15/1) of lateral and terminal saccular aneurysm models with fluid but without active flow. 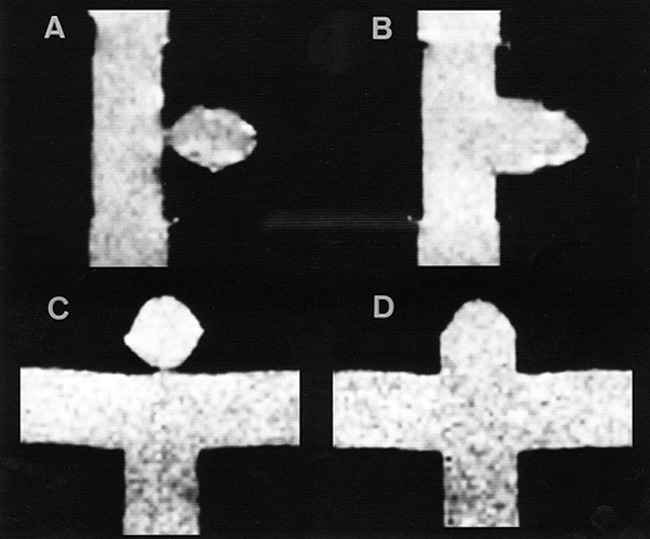 The height and fundus diameter of the models were 10 mm; the neck diameters were 2.5 mm (A, C) and 10.0 mm (B, D). 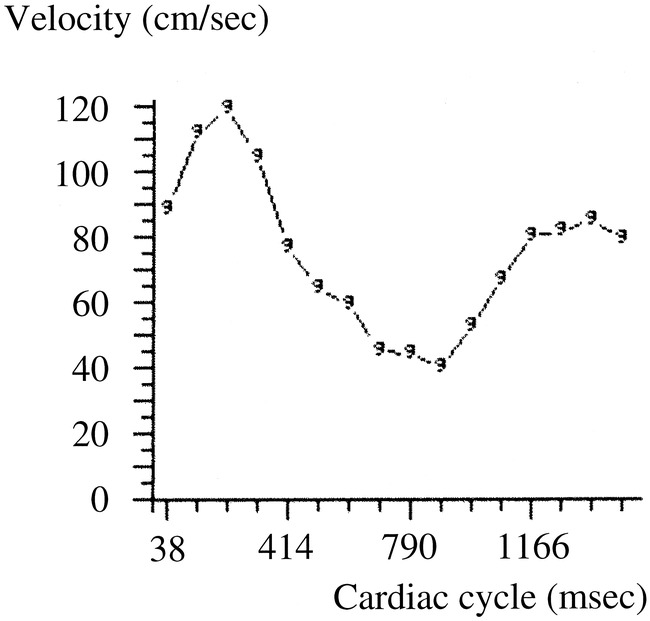 Flow velocity during cardiac cycle. Tagged MR imaging was performed using 2D fast spatial modulation of magnetization (SPAMM) sequences (5) with the following parameters: 25/5/1; flip angle, 20 °; bandwidth, 16 kHz; field of view, 20 to 26 cm; section thickness, 7 mm; matrix, 256 × 160 to 192; imaging time, 4 minutes 6 seconds to 4 minutes 54 seconds; tag space, 5 mm; intersegmental delay, 25 milliseconds; number of phases, 53. The sequence was gated from the phantom trigger. Tag stripes were placed in a transaxial direction to the parent vessel models for each aneurysm model. Tag stripes or a high-signal band between tags in the lateral saccular aneurysm models rotated like a waterwheel rotates in a stream (Figs 3–5⇓⇓). Tag stripes in the lateral saccular aneurysm model with a neck size of 10 mm rotated faster than those in the aneurysm model with a neck size of 2.5 mm (Figs 3 and 4). 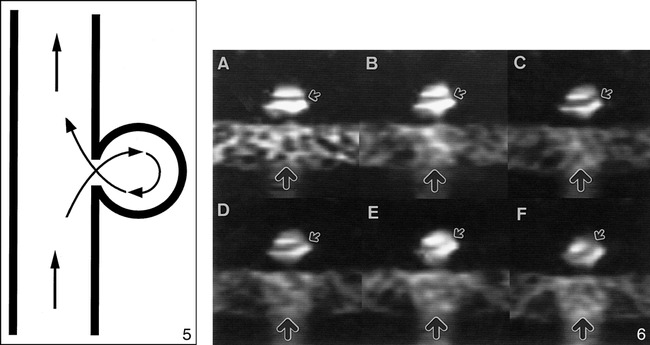 Although a tag stripe in the terminal saccular aneurysm model with a neck size of 2.5 mm rotated slowly (Figs 6 and 7), no distinct tag stripe in the model with a neck size of 10 mm was recognized (Fig 8), probably because of the very fast flow. Tag stripes in the terminal saccular aneurysm models with a neck size of 10 mm rotated faster than those in the lateral saccular aneurysm models with a neck size of 10 mm (Figs 4 and 8). Tagged MR images of the lateral saccular aneurysm model with a neck size of 2.5 mm. A–F, The time difference between images is 25 milliseconds (large arrows indicate the flow direction of the parent vessel; small arrows, the tag stripe). Tagged MR images of the lateral saccular aneurysm model with a neck size of 10 mm. A–F, The time difference between images is 25 milliseconds (large arrows indicate the flow direction of the parent vessel; small arrows, the high signal band between tag stripes). Diagram of circulation in lateral saccular aneurysm models.fig 6. Tagged MR images of the terminal saccular aneurysm model with a neck size of 2.5 mm. Diagram of circulation in a terminal saccular aneurysm model with a neck size of 2.5 mm.fig 8. Tagged MR images of the terminal saccular aneurysm model with a neck size of 10 mm. A–F, The time difference between images is 25 milliseconds (arrows indicate the flow direction of the parent vessel model). Previously reported methods for visualizing aneurysmal flow include conventional angiography (6), sonography (6), dye injection (7, 8), double refraction (8), laser-induced fluorescence (9), and computer simulation (10–12). As far as we know, tagged MR imaging has not been used in the evaluation of intracranial aneurysm models. We found this method useful in evaluating both flow rate and flow direction in the aneurysm model. Intraaneurysmal flow dynamics are thought to play an important role in developing intracranial aneurysms and in their rupture mechanisms (7). We expect that the technique of tagged MR imaging will be applied to humans for the evaluation of intracranial aneurysms, leading to further information about the mechanism of aneurysmal development and rupture. In this study, tag lines moved more rapidly in the terminal saccular aneurysm models or models with wider necks than in the lateral saccular aneurysm models or models with narrower necks. These findings are thought to reflect the fact that the flow in the terminal saccular aneurysm models or models with wider necks was faster than the flow in the lateral saccular aneurysm models or models with narrower necks. On the basis of the findings in this and a previous study by Isoda et al (4) using 3D TOF MR angiography, this angiographic technique better delineates the aneurysm models with a faster flow than those with slower flow. Limitations of the study were that our intracranial models were hard, and that the section direction of tagged MR images was perpendicular to the main parent vessels. Real aneurysms are elastic, and aneurysmal walls are expected to move according to pulsation during the cardiac cycle. Therefore, there may be some differences in flow between our hard-walled intracranial aneurysm models and real intracranial aneurysms, especially in the case of terminal saccular aneurysms. 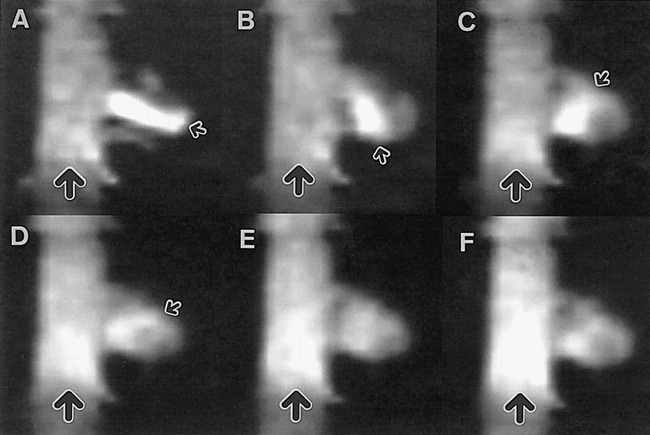 As the section direction of the tagged MR images used in this study was unidirectional, the flow rate and direction were only partly revealed. However, from our data we were able to successfully estimate flow characteristics in the various aneurysm models. Tagged MR imaging was found to be useful in evaluating the flow in models of intracranial aneurysms. Flow in the aneurysm models varied with the shape and size of the neck. The flow in the saccular aneurysm models with wider necks was faster than that in those with narrower necks. ↵2 Address reprint requests to Haruo Isoda, MD, Department of Radiology, Hamamatsu University School of Medicine, 3600 Handa-cho, Hamamatsu, 431–3192 Japan. Accepted after revision January 7, 1999.